Jungle Red Writers: An Election Day Message to All Women. An Election Day Message to All Women. From Rhys: We are not often political or controversial on Jungle Red but this weekend I have to share something that was mailed to me this week. It's a cause I feel strongly about, partly because I am so aware of the struggles of women for equal rights in the early Twentieth Century. They feature in several of my Molly Murphy books, including a suffrage march that is violently broken up in the book In a Gilded Cage. It's hard to remember that less that 100 years ago we could not vote, not own property in many states, could be legally beaten and legally raped by our husbands. So please read the following carefully and then act upon it. of our Mothers and Grandmothers who lived only 90 years ago. 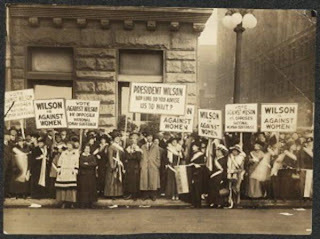 Remember, it was not until 1920 that women were granted the right to go to the polls and vote. A plucky group of women decided to picket the White House, carrying signs asking for the vote. They were arrested and thrown into jail. They beat Lucy Burns, chained her hands to the cell bars above her head and left her hanging for the night, bleeding and gasping for air. They hurled Dora Lewis into a dark cell, smashed her head against an iron bed and knocked her out cold. Her cell mate, Alice Cosu, thought Lewis was dead and suffered a heart attack. Additional affidavits describe the guards grabbing, dragging, beating, choking, slamming, pinching, twisting and kicking the women. 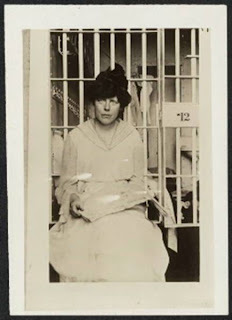 Thus unfolded the 'Night of Terror' on Nov. 15, 1917, when the warden at the Occoquan Workhouse in Virginia ordered his guards to teach a lesson to the suffragists imprisoned there because they dared to picket Woodrow Wilson's White House for the right to vote. For weeks, the women's only water came from an open pail. Their food--all of it colorless slop--was infested with worms. When one of the leaders, Alice Paul, embarked on a hunger strike, they tied her to a chair, forced a tube down her throat and poured liquid into her until she vomited. She was tortured like this for weeks until word was smuggled out to the press. When a doctor was asked to declare her legally insane and thus have her committed to an asylum, he refused to do so, stating, "In women strength is often mistaken for insanity." So, if you're not planning to vote this year because you are uninspired by any of the candidates..... If it's raining and you can't be bothered, please remember these sisters who put their lives on the line so that we could have the rights all men enjoyed. Get out and vote. You can make a difference the way they did! Fabulous, Rhys. This is an unfathomable reminder of how our sisters fought for us to have a voice. I gasped when I realized my Mother was born before these women helped secure our right to vote. Whichever side we're on, we must exercise this PRIVILEGE on Tuesday to honor ourselves and the women who stood up for us. Rhys, you're the best. Thank you. Already mailed my absentee ballot! Fifteen years or so ago, I had Carol O'Hare, who edited the book, come talk about JAILED FOR FREEDOM at the Friends of the Saratoga Public Library meeting. 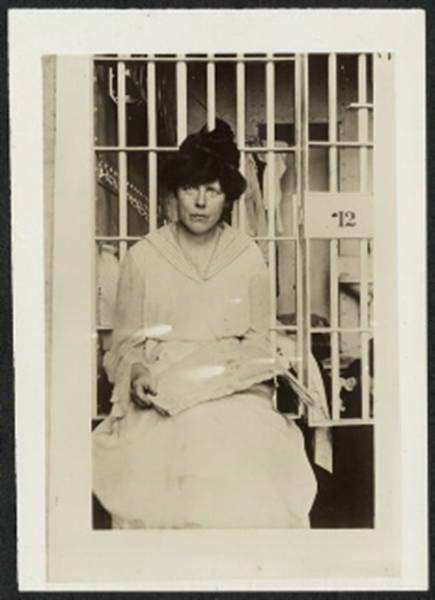 JAILED FOR FREEDOM is by Doris Stevens, who was heavily involved with the women's suffrage movement and the National Women's Party. Written in 1920. O'Hare, as editor, made the book more readable for our times and added photos. The book is a real eye-opener for people who don't realize what women went through for suffrage. And the turnout in midterm elections is often less than 40%! The mind boggles. Rhys, thank you for the reminder of what our foremothers endured so that we may have a voice in our own lives and futures. Remember also the brave people who, not so long ago, worked and suffered so that people of all races could vote. It would take an army of Tolkien Orcs to keep me from my polling place on Tuesday. What a great posting, Rhys. Ive already voted by mail and because I've traveled to some really messed up countries around the world I'm always proud of our ability to vote here. But you painted the picture in a different light and a powerful one at that. Thank you. Rhys, thank you for the reminder of what it takes to have a voice. I can't even imagine going through the torture. What passion and conviction. I never missed a vote. Thanks for the reminder of what it took for women to get the right-not privilege-to vote. I only wish that the image of a some women in very important contests wasn't setting us back in the Dark Ages. Wonderful post, Rhys. I always vote. We too soon forget what was done to get these rights - from our fight with the British to the fights in the streets and courts for equal treatment for all. Many came before us with the courage to attack what was wrong. To forget and not to partake in these rights would be a disservice to them. Rhys, thank you so much for this post. I honor those brave women each time I vote. Did you know the women's march for suffrage that preceded the White House pickets was the first demonstration in Washington? The headquarters of National Women's Party (which Alice Paul headed)has lots of memorabilia, including banners from the White House pickets. It's worth a visit. Tasha Alexander, Not at all Dangerous to Know! Would you spend a month in a museum?